Team Europe, the German startup accelerator which recently announced it would open a branch in Seoul, held a press conference to officially mark its entry into Korea yesterday. 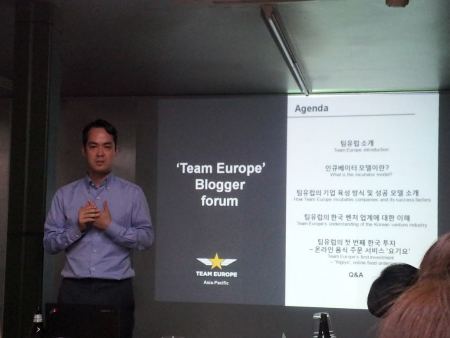 Bloggers and startup companies that attended the event showed a keen interest in the background of Team Europe’s entrance into the Korean market and the strategy behind the accelerator’s first investment in startup company “Yogiyo”. 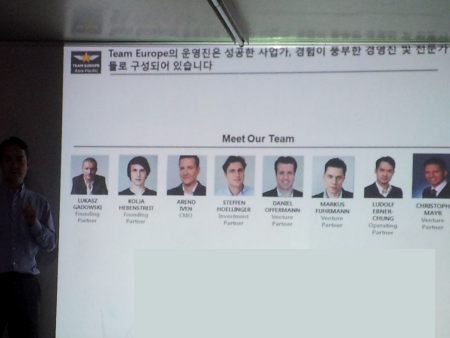 Team Europe established its Asia-Pacific branch in Seoul and is showing a strong interest in the region. Branch manager Ludolf Ebner-Chung, said that the company can contribute to Korea’s startup community and bring forth successful models to revitalize it. 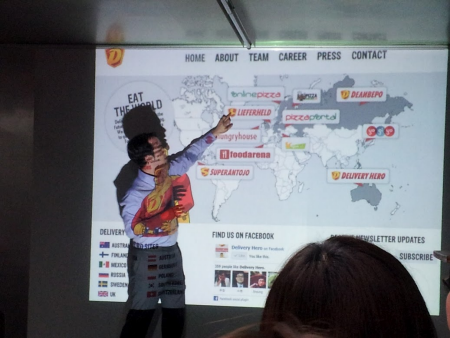 To achieve this, Chung announced that they would be pairing up with Korean accelerator Fast Track Asia. He also promised to actively encourage aspiring entrepreneurs in Korea. Chung said that Team Europe is accepting company proposals, introductions through email and investment offers, but explained that there are restrictions around the investments it makes. Team Europe usually limits its focus to B2C companies, and specifically those within the social, mobile or commerce spaces. Chung said he wanted to let young people in Korea know that there are better paths to take than just getting a position in a large company. To that end, Team Europe is ready to offer support with its team of experts and successful business people who are experienced in management. They are not only limited to one area but have the resources to carry out several launches globally at the same time. 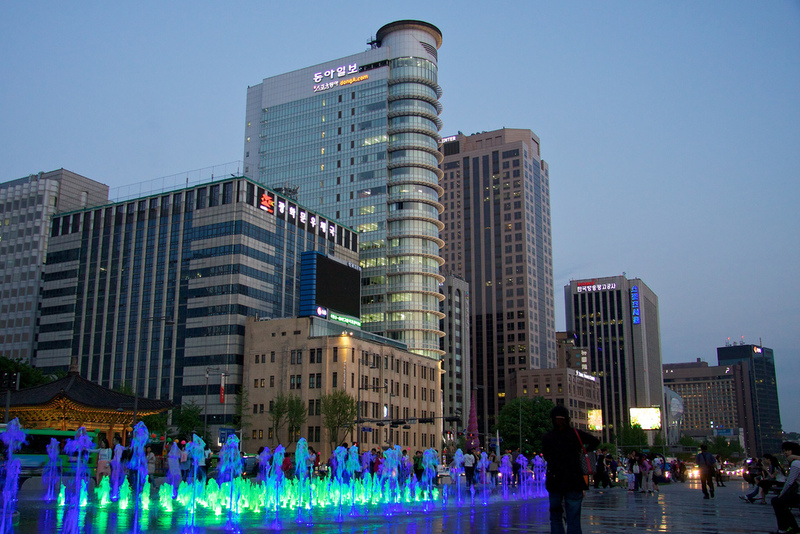 They plan to integrate their successful experiences into Korean startups and will use Seoul as a hub in the Asia region. But why is an incubator model needed? Startups need to become independent in an environment which makes it difficult and to help strengthen any weaknesses that are holding back the company. As opposed to other venture capital companies who only invest, Team Europe says it invests and offers support through experience and use of their network on a long-term basis. Putting together special characteristics and good points of both startups and franchises, another goal is to more quickly and systematically help startups focus on growth while reducing risk. Team Europe’s reason for entering Korea is to find ways to expand the entrepreneurial mindset and find ways for Korean startups to succeed by understanding what kinds of internal restrictions they face. After talking about the new branch in Seoul, Team Europe also introduced Yogiyo, its first company selected for investment. Yogiyo was founded by Na Jewon after selling the social commerce site “SugarDeal” to WeMakePrice. It is a food delivery service that takes customer payments online.